This is a local version of http://www.tfhrc.gov/pubrds/marapr00/concrete.htm. The basic principles of concrete barriers are not generally known or understood. Concrete barriers appear to be simple and uncomplicated, but in reality, they are sophisticated safety devices. Figure 1 — Concrete safety shape profiles. For higher impact angles, the NJ-shape is actually a multistage barrier. The front bumper impacts the upper sloped face and slides upwards. This interaction initiates lifting of the vehicle. If the bumper is relatively weak, the front end starts to crush before any uplift occurs. Then, as the vehicle becomes more nearly parallel with the barrier, the wheel contacts the lower sloped face. Most of the additional lift of the vehicle is caused by the lower sloped face compressing the front suspension. However, wheel side-scrubbing forces provide some additional lift, particularly if the barrier face is rough. Therefore, exposed aggregate and other rough surface finishes should be avoided. Modern vehicles have relatively short distances between the bumper and the wheel; as a result, bumper contact is followed almost immediately by wheel contact. Years ago, it was common practice to form a 255-millimeter (10-inch) radius at the intersection of the two sloping surfaces to facilitate slipforming the barrier. This radius is no longer necessary for slipforming. Modern slipforming machines can readily slipform concrete barriers up to 1320 mm (52 in) in height without a radius. The 75-mm (3-in) vertical "reveal" at the base of the barrier is only intended to provide a neat line for asphalt resurfacing. This vertical reveal makes very little change in the vehicle dynamics because it has about the same effect as hitting a 75-mm curb. Drainage openings in the face of the reveal do not have a significant effect on an impacting vehicle. Higher openings should not be used because wheels and bumpers can interact with them, snagging and causing the vehicle to yaw. Wherever possible, drainage should be collected along the toe of the barrier because a drainage depression or curb out in front of a concrete safety shape can cause vehicle instability and lead to rollover. The key design parameter for a safety shape profile is the distance from the ground to the slope break point because this determines how much the suspension will be compressed. For the NJ-shape, this distance is 330 mm (13 in). Figure 2 — NJ Turnpike Authority's heavy-vehicle median barrier. The old General Motors shape, or GM shape, had a distance of 380 mm (15 in) from the ground to the slope break point. This higher distance caused excessive lifting of the small cars of the 1970s, such as the Chevrolet Vega. After impacting the GM shape in crash tests, these small cars became unstable and tended to roll over. As a result, the use of the GM shape was discontinued. A parametric study (systematically varying the parameters) of various profile configurations that were labeled A through F showed that F performed distinctly better than the NJ-shape. The results of these computer simulations were confirmed by a series of full-scale crash tests. Configuration F became known as the F-shape. Even though the performance of the F-shape was superior to the NJ-shape performance, it was not widely used. This was because the states were well-satisfied with the NJ-shape, which also met the crash-test criteria. In addition, their contractors did not want to change profiles because they had a considerable investment in the forms required to produce the NJ-shape. As shown in figure 1, the slopes of the F-shape and the NJ-shape are the same. The major difference is that the distance from the ground to the slope break point of the F-shape is 255 mm -- 75 mm lower than the NJ-shape. The lower slope break point significantly reduced the lifting of the vehicle and greatly improved the performance of the concrete barrier. The NJ-shape and the F-shape profiles are closely related. If you make a 75-mm asphalt overlay next to the NJ-shape (and mentally cut a new 75-mm reveal in the concrete that remains above the asphalt surface), you have converted the NJ-shape into an F-shape. This means that asphalt resurfacing work can actually convert the NJ-shape into a safer design. However, these asphalt overlays will reduce the overall height of the concrete barrier and, consequently, reduce its effectiveness for heavier vehicles. When a single-unit truck, such as a Ryder or U-Haul rental truck, hits a concrete barrier in a crash test, it rolls toward the barrier until the underside of the truck bed comes to rest on the top of the barrier. This stops the roll motion. Then, the vehicle slides along the top of the barrier until it is redirected upright. For this to occur, the concrete barrier must have a minimum height of 815 mm (32 in). To contain and redirect an "18-wheeler" or tractor-trailer in a crash test, a concrete barrier must have a minimum height of 1070 mm (42 in). In these collisions with trucks, the primary load path is vertical because the load is transferred from the underside of the truck bed or trailer to the top of the concrete barrier. A concrete barrier is essentially a short, stocky column that can easily resist these vertical loads. Because trucks, buses, and other heavier vehicles tend to slide along the tops of concrete barriers, it is important to keep the tops of these barriers free of signs, fences, luminaire supports, and other appurtenances that could snag the vehicle and cause it to yaw. When it is necessary to provide luminaire supports on concrete median barriers, the barriers can be made thicker at the top in the vicinity of the luminaire support and flared out on the sides to provide a smooth lateral transition section for the impacting vehicle. Higher concrete barriers are sometimes used as truck barriers and to provide an integral glare screen on concrete median barriers (CMB). The deck of a tractor-trailer is located about 1350 mm (53 in) above the ground. Because the deck is a strong, stiff structural member, it can produce significant lateral forces when it impacts a concrete barrier. Therefore, any concrete barrier that is higher than 1320 mm (52 in) should have some reinforcement near its top -- if only to prevent spalling concrete from flying into oncoming traffic. Some states have slipformed concrete glare screens on top of existing concrete barriers. Usually these concrete glare screens contain some reinforcement to prevent spalling. 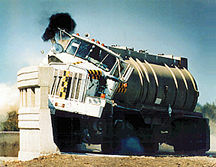 To contain and redirect a 36,000 kg gasoline tanker after impacts at high angles and speeds, a 2290-mm (90-in) concrete barrier is required. The New Jersey Turnpike Authority (NJTA) has crash-tested and developed a 1070-mm- (42-in-) high concrete median barrier that can safely contain and redirect tractor-trailers to an upright position. This barrier is made with the NJ-shape forms. The 75-mm vertical reveal is covered up with asphalt to anchor the barrier against overturning. (See figure 2.) This turns the barrier profile into an F-shape that does not have a vertical reveal. The NJTA's Heavy-Vehicle Median Barrier is 305-mm- (12-in-) thick at the top. It is heavily reinforced. The Ontario Tall Wall is a 1070-mm-high concrete median barrier with the same profile, but no reinforcing. A crash test with a 36,000-kilogram (80,000-pound) tractor-trailer at 85.3 kilometers per hour (53 miles per hour) and an impact angle of 15 degrees demonstrated that reinforcing was not necessary ecause the Ontario Tall Wall is 305 mm at the top. Even though concrete shrinkage cracks formed vertically approximately every 2440 to 3355 mm (8 to 11 feet) and penetrated completely through the cross section of the barrier, the cross-sectional area and the aggregate interlock were sufficient to transfer all of the lateral impact forces across the cracked cross-sections. The 75-mm-thick asphalt overlays that anchored both sides of these high-performance median barriers did not separate from the concrete during the crash tests with tractor-trailers. Other crash tests have shown that 25.4-mm- (1-in-) thick asphalt overlays on both sides of 815-mm- (32-in-) high concrete median barriers are sufficient to anchor them for impacts with passenger cars and buses. Many states use concrete safety shape barriers that are only 150-mm- or 200-mm- (6-in- or 8-in-) thick at the top. Tractor-trailers can break off a V-shaped piece of concrete at the construction joints and climb on top of these barriers. However, this is such a rare occurrence that most states do not find it economically feasible to use thicker barriers or to increase the reinforcement in the vicinity of the joints. Gasoline tanker semi-trailers do not have any exposed structural elements between the wheels and the tank, which is centered about 1980 mm (78 in) above ground. In other words, there is nothing for the barrier to push on between the wheels and the tank. The 1070-mm wheels can interact with a 1070-mm-high concrete barrier and redirect the vehicle in shallow-angle impacts. (See figure 2.) However, to contain and redirect a 36,000-kg gasoline tanker after impacts at higher angles and speeds, a higher 2290-mm (90-in) concrete barrier is required. When a concrete safety shape lifts a vehicle, some of the kinetic energy of the vehicle is converted to potential energy. This potential energy is turned back into kinetic energy as the vehicle returns to the ground. Vertical concrete parapet walls do not have this energy management feature, but crash tests have demonstrated that they can perform acceptably as traffic barriers. All of the energy absorption in an impact with a rigid vertical wall is due to crushing of the vehicle. Bumpers usually do not slide up vertical concrete walls and lift the vehicle, so all four wheels tend to stay on the ground. This minimizes the potential for vehicle rollover. Because the vehicle is not lifted and tilted by the vertical face, this also increases the possibility of a motorist's head going through a side window and contacting the vertical barrier. Vehicle wheels are primarily designed to handle vertical loads, not horizontal loads. The trajectories of passenger cars after crashing into vertical concrete barriers can be uncertain because of wheel damage that can occur when the front axle contacts the barrier. The need to have a single-slope barrier profile that has more consistent performance than a vertical-face concrete wall led to the development of constant-slope barriers. Both constant-slope barriers and vertical concrete walls can facilitate resurfacing because their performance is insensitive to the thickness of the asphalt overlay. This is particularly advantageous when constructing barriers on curved ramps and for resurfacing operations that otherwise would require resetting concrete safety shape barriers. Up to 255 mm (10 in) of overlay can be made before the barrier height is reduced to 815 mm (32 in). 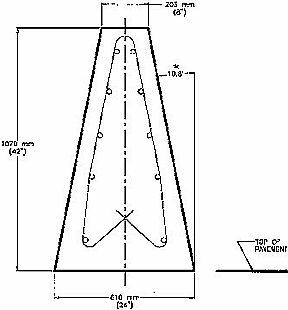 The Texas Constant-Slope Barrier is 1070 mm (42 in) high and has a constant-slope face that makes an angle of 10.8 degrees with respect to the vertical. (See figure 3.) It was originally tested and developed for use as a temporary concrete barrier, but it has been widely used as a permanent concrete median barrier. California developed a constant-slope profile that makes an angle of 9.1 degrees with respect to the vertical. This is closer to the 6-degree slope on the upper faces of the NJ-shape and the F-shape. 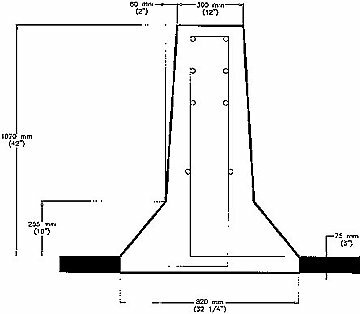 California has used this constant-slope profile for their 1070-mm-high Type 60 roadside barrier and for their Type 70 bridge rail. The crash tests indicate that the performance of the Texas Constant-Slope Barrier is comparable to that of the NJ-shape and the performance of the California Constant-Slope Barrier is comparable to that of the F-shape. These constant-slope barriers have both been tested with the 8000-kg (18,000-lb) single-unit truck in accordance with NCHRP Report 350, and they are both Test Level Four (TL-4) barriers. To date, constant-slope barriers have not been crash-tested with tractor-trailers or other heavy vehicles; therefore, their upper performance limits have not been established. This 510-mm- (20-in-) high portable concrete barrier, developed by the Texas Department of Transportation, has a reverse slope that is 2.8 degrees (1 in 20) with respect to the vertical. This low-profile concrete barrier was successfully crash-tested with a pickup truck at 72 km/h (45 mi/h). Portable concrete barriers (PCBs) have greatly improved safety in construction work zones. PCBs are made of precast concrete safety shape sections joined together to form a continuous longitudinal barrier. Because portable concrete barriers are primarily intended to keep errant vehicles from hitting construction workers, the dynamic lateral deflection of these barriers must be kept to a minimum. In general, barrier deflection can be minimized by using longer barrier segments and by using joints that can develop a bending moment of 6913 kg-m (50 kip-ft) or more. Pin and loop connections are very popular because they can readily accommodate horizontal curvature and changes in vertical grade. 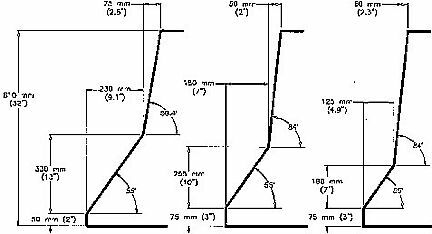 However, they can only develop bending-moment capacity after the joint has undergone a significant amount of rotation. A washer or cotter pin at the bottom end of the steel pin is necessary to prevent the pin from jumping vertically out of the loops upon impact. Loops made of reinforcing bars are better than wire loops because they can resist torsional rotations of the barriers at the joints. Pulling the barrier segments tight and anchoring the end segments to the ground are also very helpful in reducing the lateral deflection. Anchoring each barrier segment with steel pins driven into the ground is very effective, but it is labor-intensive and makes the barrier less portable. If a sloping face on a concrete barrier can lift a vehicle, then it stands to reason that a slope in the reverse direction can tend to hold the vehicle down by pushing the bumper downward. A 510-mm- (20-in-) high portable concrete barrier has been developed by the Texas Department of Transportation for use in work zones and intersections in which driver sight distance would be blocked by a higher barrier. The reverse slope is 2.8 degrees (1 in 20) with respect to the vertical. This low-profile concrete barrier was successfully crash-tested with a pickup truck at 72 km/h (45 mi/h). It has not been tested at higher speeds or with larger vehicles. Each of these concrete barrier types fills a niche and helps meet the needs of highway agencies that select, design, and locate traffic barriers. In terms of safety performance, the 1070-mm (42-in) F-shape is currently our best technology. The F-shape profile is clearly superior to the NJ-shape and is gradually being used by more states for both portable concrete barriers and permanent barriers. Charles F. McDevitt is a structural engineer in the Federal Highway Administration's Office of Safety Research and Development at the Turner-Fairbank Highway Research Center in McLean, Va. He has 39 years experience in designing, testing, and developing new products. He joined the Federal Highway Administration in 1978. For the last 22 years, he has worked on developing new and improved traffic barriers. He has a master's degree in civil engineering from the University of Pennsylvania, and he is a registered professional engineer in Pennsylvania.